Japanese girls spent a lot; want to touch Fahrenheit. Yesterday Fahrenheit went to Tokyo Japan for hands shake meeting, the place can fit in 1500, but if you want to enter, you have to spend almost $9000 , Japanese girls did not hesitate for spending money, fans and around 40 Japanese media made the place really crowded. They earned $13,500,000 Of course Fahrenheit is very delighted about this. And before the function, Jiro Wang put on a lot of hand cream, he said "so when I shake hands with fan, they can feel that my hands are smooth"
Taiwan male idol entering Japan's market, yesterday in the place, from first year in primary school to 60 years old woman are screaming at Fahrenheit, also there were Japan media asking "Are Taiwanese boys all good looking like you guys?" 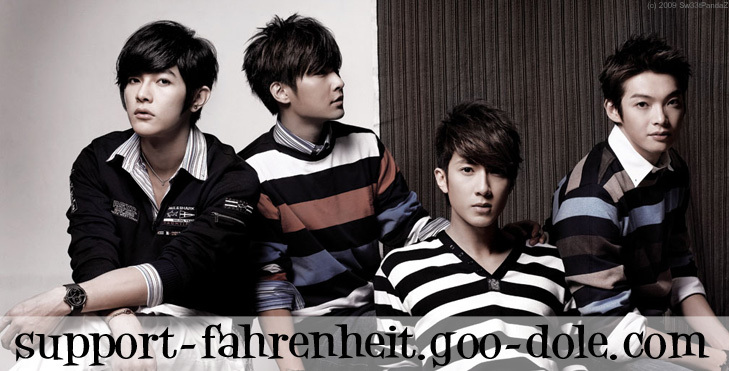 this made Fahrenheit very happy, feel like they did something for the country. Actually, if you want to join in this function, fans have to buy all "Tokyo Juliet" DVDs, Fahrenheit Photo Album and CD all three products, also first come first serve. But Japanese fans buying things were always freaky, tickets were exchanged in a short period of time. This trip to Japan, Fahrenheit only stayed for 16 hours, beside the fans meeting they have to interview with 15 Japan media. In the backstage the clothes they prepare for all interviews and function, they spent $600,000, if buy them it costs $1,800,000. Fahrenheit were very happy picking clothes in the back stage. Everyone worrying if they fight for clothes? Manager said "They have different liking, they don't"
The four boys have different rule for picking clothes, like Wu Chun is sporty and athletic, he can't wear pants that are tight in the legs. Jiro Wang likes bright-colored clothes, Arron Yan never wears shorts, Calvin Chen because his shoulders are not wide, he cant wear clothes they show his shoulders. And what did the four boys said when they went on stage? Everyone would ask the fans how are their doing with the Japanese they know, Only Wu Chun that likes to eat never changes, where ever he goes ion stage, the first he says is "Is everyone full?" just to shake hands??? wouldn't u hav better luck in going to taiwan and just walking around.. ?? I wouldnt spend THAT much money to shake hands with fahrenheit... on second thought i wouldnt even wanna spend $1 (well maybe $1 LOL) to shake hands with anyone. Sure i could do that, if it was free... i cant exactly fly all the way to taiwan and look all over taiwan for the fahrenheit members can i? i no this is cheesy but u can do anything you put ur mind too! I have lots of chinese friends (since im chinese) and none of them likes fahrenheit, they dont even listen to chinese music!! Well one of them do but she doesnt listen to fahrenheit. Maybe those japanese girls are really rich, so they dont mind spending much! hmmm yea probably... but how do they get so rich? I mean theyre just teen girls right? Subject: Re: Japanese girls spent a lot; want to touch Fahrenheit.